Property Size 2,834 sq. ft. This beautiful home has been completely remodeled by the new owners. The attention to detail will delight your family and make for the perfect vacation. It's the little touches that make all the difference. 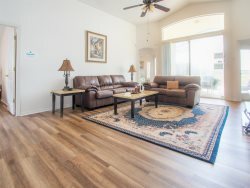 Large, flat screen TVs including a 50" in the living room; DVD players in all the bedrooms; a Keurig coffee maker in the kitchen; a computer nook with a printer, board games and more. The home is located just down the road from Champion's Gate Golf Club which features two premeir 18 hole championship golf courses designed by Greg Norman. Whether you recharge by relaxing next to the private pool, playing a round of golf on a premier course or enjoying the excitment of world class theme parks, this is the perfect home away from home for your next vacation. 5 Bedroom/3 Bathroom Home with Private Screened Pool, Hot Tube, Gameroom, Master Suite, Two King Beds, Themed Bedrooms, Soaking Tub, Washer/Dryer, Fully Equipped Kitchen, Free Wireless Internet, Expanded Cable, Close to Disney, Gated Community. A Disney Entrance is only 6.9 miles away. Sea World, Universal, and the Convention Center are approx. 15 minutes beyond that. Important Note: This property only has parking for two vehicles. Any vehicle parked in the street or on the lawn will be towed by the HOA. If you have more than two vehicles, you are responsible for arranging for parking outside the community. We have stayed with Florida Dream Homes several times and each time it is wonderful!!! The houses are always beautiful, well kept and all the furnishings. I would HIGHLY recommend that you stay with them!! Absolutely loved staying in your vacation home. Home was beautiful, accommodated everyone that stayed with us well. House was well stocked with essential things you would need for your stay. Staff were attentive to any questions that we had. Would recommend to anyone to stay with Floridadreamhomes. Plan to stay again. I have stayed in Florida dreams homes before but this home is by far the nicest one I have been in. It has everything possible that you would need even to the office equipment and the game area in the garage. I would and will in the future stay at this home again. We hated to go home. This home met our needs! We traveled with our two kids and their families and there was plenty of room for all 10 of us. The grandkids loved their decorated rooms and spending time together. The adults enjoyed our meals in the dining room while the kids had their own table. They felt like big kids! I would have enjoyed a king bed downstairs for grandma and gramps, but we were comfortable enough. This was a great house. We were there on a business trip and some problems getting the wireless internet and printer at the house to work, but after a few phone calls we got everything worked out. Beds were comfy. Kitchen supplies were limited, but had necessities. The house and the neighborhood were excellent. We enjoyed having the enclosed lenai and pool. The one concern that we had was that a service employee entered the home on the day that we checked in without having notified us that he was coming. Fortunately, our dog alerted us to his presence and he quickly retreated. As you can imagine, it was a frightening experience. However, the employee quickly apologized when we got to the front door and saw who it was. In the future we recommend that all service employees check with the Florida Dream Homes office before going to a home that has visitors scheduled. What a better way to start and end long days at the theme parks than relaxing in your very own "home away from home." 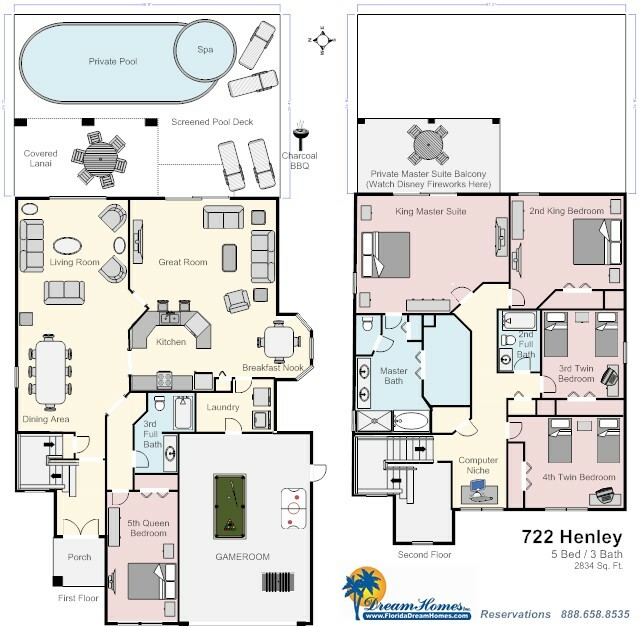 The house was very comfortable and had plenty of room for everyone to have their own space, yet the floor plan and features like the pool and game room also allowed for us to be together for meals and family activities. The kids loved the pool and watching the fireworks in the distance from Disney was a great touch to end the day. My families great vacation could not have taking place without the great rental home our family used while visiting Disney land. We all loved the lay out of the house as well as the interior decor. It had plenty of room for 12 people. The grandchildren were in the pool except when at Disney. I would highly recommend this home to any large family wanting to stay inthe Kissimmee area of Florida. We had a great time. The house is beautifully decorated and kitted out with everything we needed. We were two families and our Nana and had the most wonderful time. We just hung out, enjoyed the games room, swam, and strolled the nice quiet and safe neibourhood. We will be recommending it to all our friends and will be back!